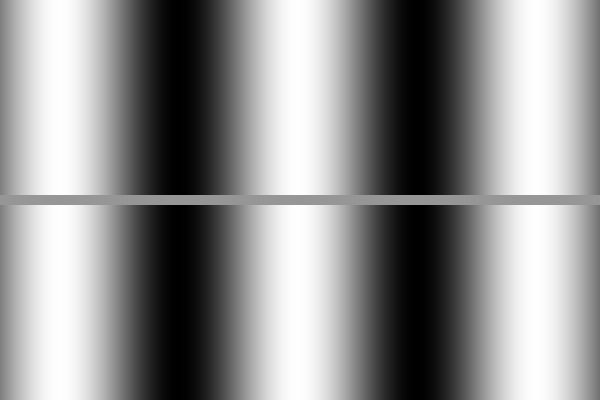 The white background behind the gray waves appears to be darker than the rest. This effect was discovered by Seiyu Sohmiya in 2006 (personal communication). 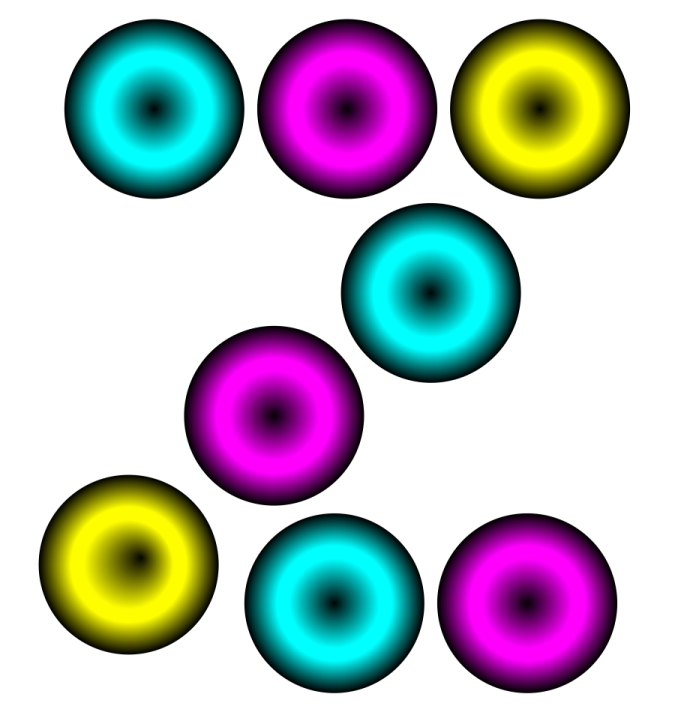 Cyan, magenta and yellow rings appear to shed light and include Mach bands. 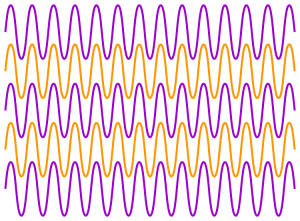 Mach bands give illusory convex or concave rings. 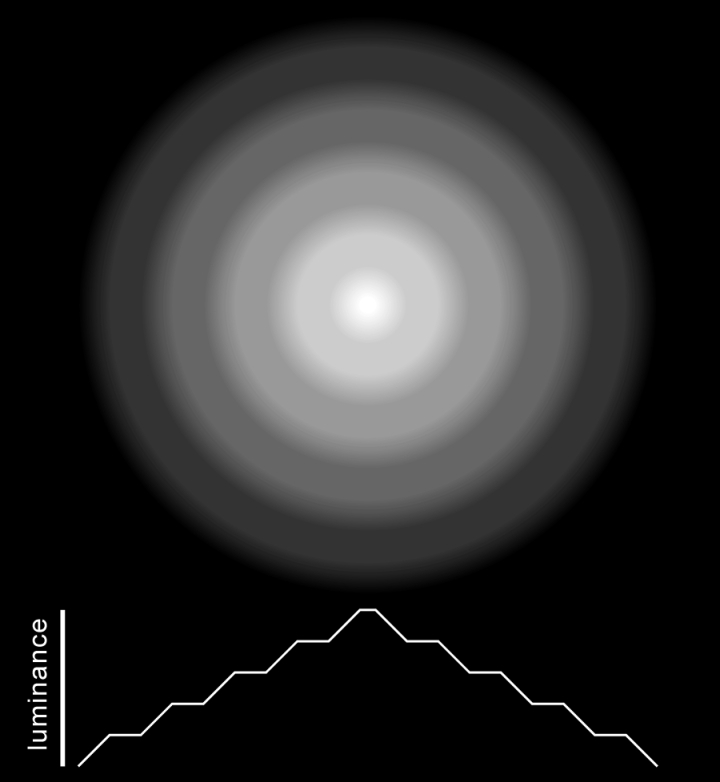 The rings of luminance gradient appear to be convex while those of homogeneous luminance appear to be concave. This idea was given by Zen Tobinaka. 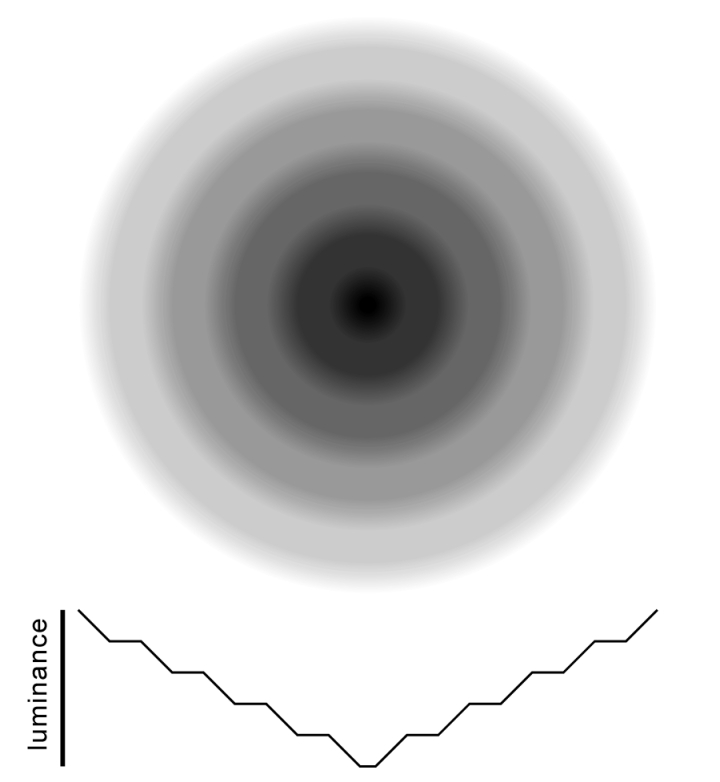 "Craik-O'Brien-Cornsweet effect-dependent radiation perspective and an angel"
There are six pie slices; three of them appear to be darker than the rest, though they are the same in luminance except around their borders. 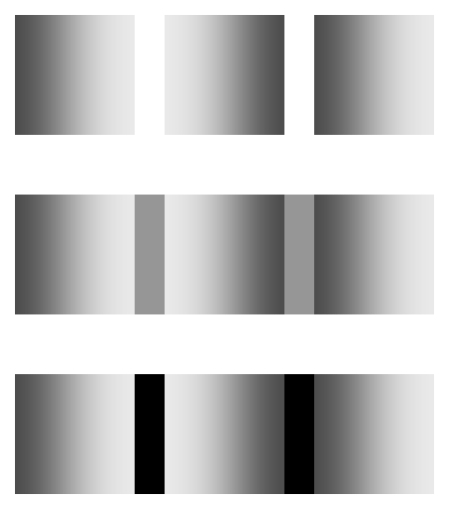 Craik-O'Brien-Cornsweet effect: There appear two dark columns in front of the light background, though they are the same in luminance except around their contours. Cornsweet, T. (1970) Visual Perception. New York: Academic Press. Craik, K. J. W. (1966) The Nature of Psychology: a Selection of Papers, Essays and Other Writings. Cambridge, UK: Cambridge University Press. O'Brien, V. (1958) Contour perception, illusion and reality. Journal of the Optical Society of America, 48, 112-119. The clothes of the left phantom appears to be lighter than those of the right one, though they are the same luminance. 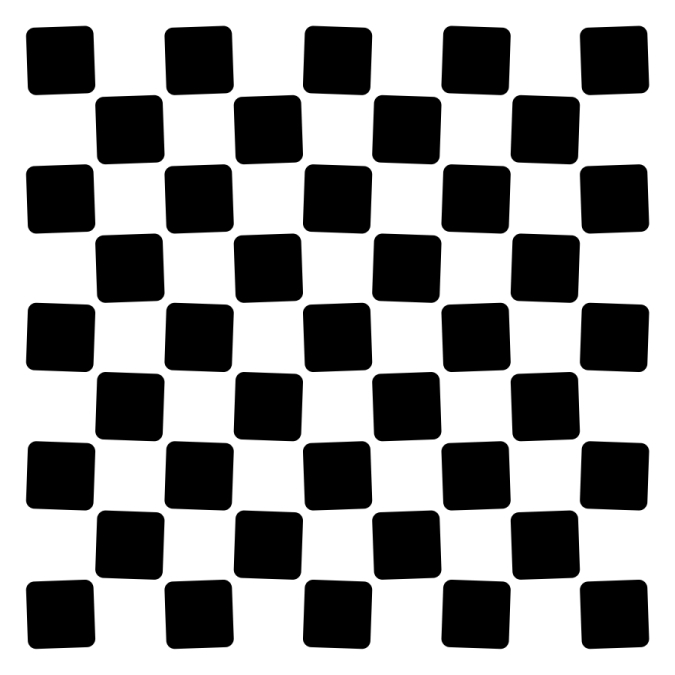 An illusory grating appears at each gap between adjacent stones . A surface having holes on it appears to be lighter than it is. 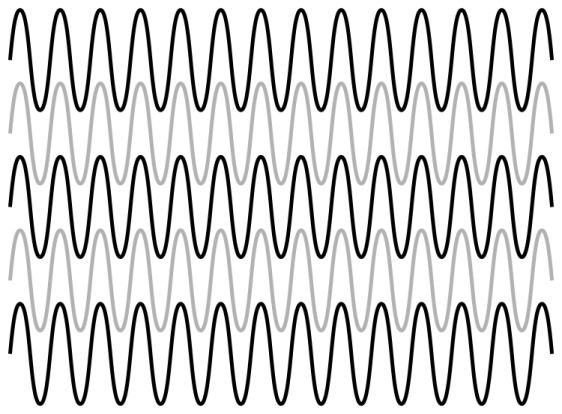 The horizontally-drawn thin occluder appears to have a luminance modulation, dark-light-dark-light-dark, but this appearance is the reversal of the physical property. 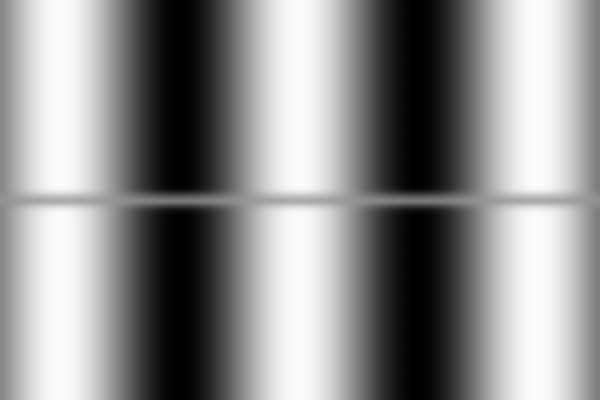 Actually, the thin line has a luminance grating, light-dark-light-dark-light. This fact can be confirmed by placing the cursor on the image. I suggest that this illusion be an enhanced version of grating induction (McCourt, 1982). Moreover, this illusion might be the fundamental component of the Mimas-and-the-F-ring illusion.  The horizontally-drawn thin occluder appears to have a luminance modulation, dark-light-dark-light-dark, but it is a brightness/lightness illusion. Actually, the thin line is homogeneously gray. This fact can be confirmed by placing the cursor on the image. Grating induction in the "F ring in front of Mimas"
The horizontally-drawn thin occluder appears to have a luminance modulation, light-dark-light, but it is a brightness/lightness illusion. Actually, the thin line is homogeneously gray. This fact can be confirmed by placing the cursor on the image. The left bar is the same luminance as the right one in each row, but the left one appears to be darker than the right.